There are millions of charitable nongovernmental organizations (NGOs) around the world addressing untold numbers of critical issues that keep communities from flourishing. So, why did FedEx designate one of its five philanthropic focus areas to be centered on road safety? According to the World Health Organization, more than 1.5 million people are killed on the world’s roads every year, and as many as another 50 million are injured. In addition to the heavy toll of human suffering, the cost of road traffic crashes may add up to as much as 3-5 percent of a country’s GDP. When FedEx announced our FedEx Cares program in 2016, to invest $200 million dollars in 200 communities around the world by 2020, we also unveiled five focus areas upon which we would focus our efforts: Global Entrepreneurship, Employment Pathways, Sustainable Transportation, Delivering for Good, and Road Safety. Information on these focus areas may be found at fedexcares.com. We chose areas that are strongly aligned with our company’s strengths, areas where we may make the most impact, providing not only financial assistance, but also professional expertise, to help NGOs in their work. With more than 150,000 vehicles on the world’s roads, road safety is important to us. Drawing on an excellent safety record in our operations, we have been able to support road safety NGOs with invaluable engagement. 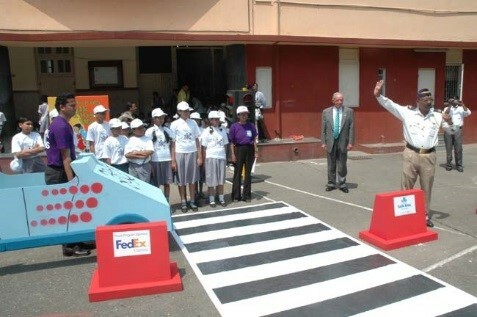 FedEx has worked with some of the world’s leading road safety NGOs. We’ve helped address infrastructure issues, and the safety of vulnerable road users…especially children. We’ve worked with Safe Kids Worldwide, the UN Global Road Safety Collaboration, the International Road Assessment Program, the World Resources Institute, Fundación Gonzalo Rodríguez, the Global Road Safety Partnership, Amend, the University of North Carolina’s Highway Safety Research Center, and others. In recent years, we’ve worked with the Global Alliance of NGOs for Road Safety, an alliance of 200 road safety NGOs working in more than 90 countries. Through the FedEx-sponsored Alliance Empowerment Program, we’ve helped Alliance members with significant road safety initiatives. After participating in the program, one NGO leader returned to her home country and implemented an initiative that activated a national seatbelt law. After the activation in 2017, in the first two months, there was a 35% reduction in road traffic crash fatalities from the same period in 2016. So, why do we help road safety NGOs in 90 countries? To apply our expertise and resources to help bring down the number of children and adults killed and injured on the world’s roads: 1.25M and 50M respectively. In follow-up articles, we’ll highlight our work with individual road safety NGOs. We’ll share how we began working with them, the kinds of initiatives we’ve helped with, and what we’ve been able to accomplish together. The first collaboration we’ll share about is the one we have in 10 countries with Safe Kids Worldwide. Stay tuned!